It was summer’s day in 1740, and a beautiful day for a wedding. Anna Skłodowska scanned the array of presents which had been brought to start her off in married life. One piece stood out to her, a pewter spoon which shone a brilliant silver. 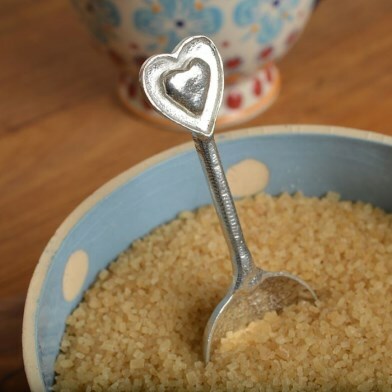 It was a little smaller than a soup spoon, and while it matched none of the others that would serve in her kitchen, it would take pride of place both as one made especially for her wedding day, and also because of the beautiful handle which ended in a stylised heart. It was crisp autumn’s day in 1790, Katrina Kowalczyk with sorrow, but some measure of joy opened the small parcel sent as her inheritance on the death of her “Babciu.” It contained a small hand written recipe book, and a heart-handled pewter spoon, which many of the culinary formulas were measured in. It would make for many happy meal, and even happier memories. It was a harsh winter in 1812. Napoleon’s armies had ravaged the lands, and food was short. Many had barely enough to live on. Katrina opened her door to a feeble knock, and found a young man collapsed in the snow before her threshold. She dragged him into the house and placed him before the fire. He was far too weak to lift his head, much less a cup. She did her best to prop him up and devotedly lifted sips of warm broth to her grandson’s lips from a heart-pommeled spoon. It was in May of 1870 that eight-year-old Jan Piotrowski made a discovery while playing with his toy soldiers at the roots of the old apple tree. He was digging a small trench for his men when he found that he was not the first to have done so at the place. There, only a few centimetres down, were five lead soldiers in Russian uniform. They must have been forty or fifty years old, and along with them was a tarnished grey spoon with a heart on its end, which must have been used as a kind of shovel. It was May 1940 and the family was told to pack their belongings quickly, as they were to be relocated to the East. Precious family photos, a few personal mementos, and the silver-ware, including an odd little pewter spoon, were place in a case which marked with the family name. They then placed the case in the row with the others, and clambered up into the waiting truck. It was November 1943, and Novak Staszek, number 23xxx, a carpenter in the camp was given a gift by his friends in the metal-workers hut. It was a small ring baring the initials N. S. made from a piece of spoon handle. “The stylised heart motif between the letters”, they said, “meant life.” And it was to him life, he was no number, he was a man. He was alive, and would remain so long after the Nazi terror had passed. Awesome post, My Friend!! Thanks so much for sharing this!! Fantastic, I loved how you tied in so much history with these little moments.